Last weekend envelope users contributed 92% of our income. Question for Children? What makes me afraid? How can I remember that God is always with me? Teaching children that God loves them and is always with them is a very important lesson. Take the time to discuss the idea of God’s love for them and what it actually means in their day to day lives. Children will readily admit that they believe in God’s love but applying God’s love in real situations is not always easy. This is a great exercise to do with children. What was a Devil’s Advocate? This term is fairly familiar to modern day adults. It simply means to take the opposite view point and to challenge the opponent. In the church, however, the title of Devil’s Advocate had a very specific meaning. It referred to the person who was formerly assigned the responsibility of presenting negative information about candidates who were being brought forth for sainthood. This Devil’s Advocate was often a Cardinal who would familiarize himself with the story of the person being brought to the pope for sainthood. He would then proceed to bring out all the negatives of this person, making sure that the pope would have a well balanced, not biased, perspective on the candidate. This process became necessary when the church began to fear that some candidates were being falsely admitted into the canon of the church. The practice has now been eliminated from the process however. 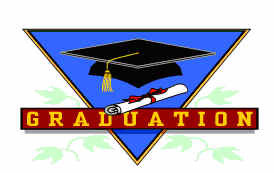 Congratulations to all students who are graduating this month. Regardless of your level of achievement, you have all reached a very important milestone in your lives. You have worked hard and you have succeeded in attaining your goal. You are to be commended. The faith community of St. Paul congratulates you and wishes you well. We also offer a prayer that you will be blessed with God’s presence in your life and that you will receive every grace you need to be happy. Adoption Baby. . . month six. The baby’s oil and sweat glands are functioning; these help regulate body temperature. A white filmy layer covers the baby and protects his/her delicate skin from the surrounding amniotic fluid and from scratches as the baby twists and turns. This waxy substance will be quickly absorbed into the skin soon after birth. He/She can now respond to sound. The lungs are fairly well developed and he/she would stand a good chance of survival if born at this time.